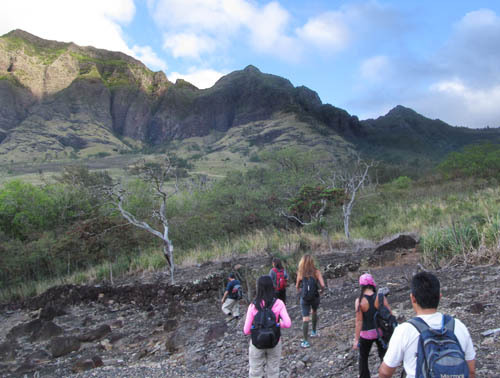 We ascended a spur on Kamaileunu Ridge to the summit of Kawiwi, traversed along the spine towards Mount Ka‘ala and descended the Wai‘anae Kai Trail to loop back where we started. 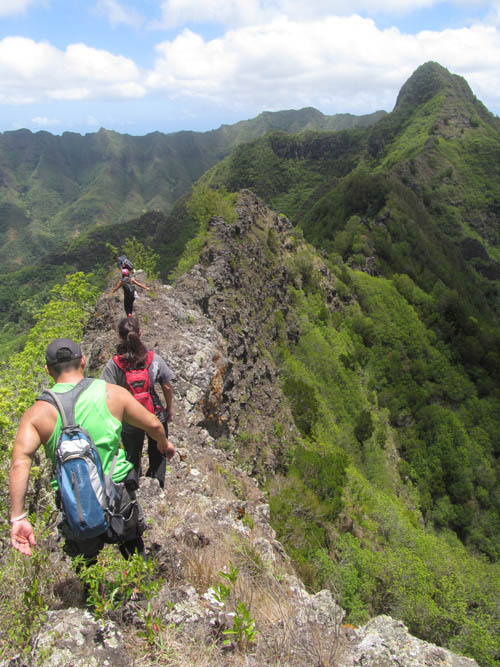 Kawiwi is the 2,957 foot peak on Kamaileunu Ridge — the ridge that divides Wai‘anae from Makaha — further inland from the summit of Kamaileunu which tops out at 3,210 feet elevation. Because of its defensible topography, Kawiwi was used as a fortress in times of conflict and war prior to Western contact. When the King of Maui, Kahekili, invaded O‘ahu, the vanquished defenders made their last stand at Kawiwi before being crushed by Kahekili who became the undisputed ruler of Maui, O‘ahu, Moloka‘i, and Lana‘i until his son, Kalanikupule, was defeated by Kamehameha. 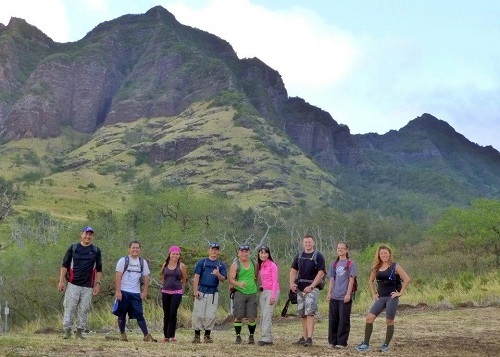 With the summit of Kawiwi looming behind, we took this group shot after meeting at the end of Wai‘anae Valley Road — from left to right: Nate Yuen, Troy Solano, Tess Cochran, Baron Yamamoto, Gary Kitahara, Aida Gordon, James Beckwith, Chelsea Osaki, and Evlyn Gomez. Baron Yamamoto led the way as we hiked up the paved road. Although the skies were mostly clear overhead, a wall of clouds over Mount Ka‘ala blocked the sun and a strong wind whipped through Wai‘anae Valley. 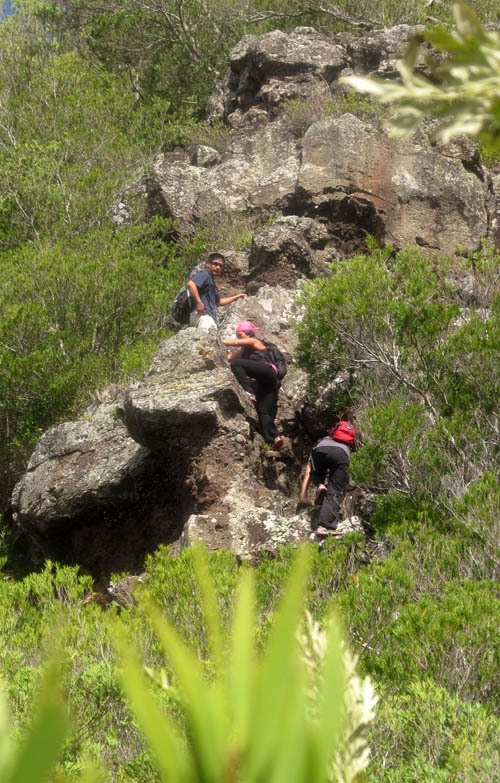 When we reached the firebreak — where the vegetation has been cut down to prevent brush fires from jumping over — we veered-off the paved road and headed downhill along a rock wall until we reached a shallow gully. 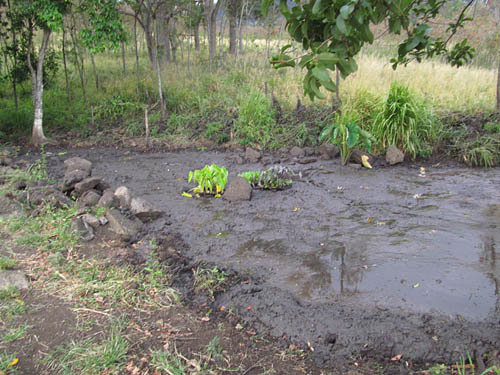 We hiked up the shallow gully where we came upon a natural springs were kalo (taro) has been planted. I recalled that the last defenders of O‘ahu would sneak down from the summit of Kawiwi at night to get badly needed water and food. I speculate that this might be one of the places they came to get water. 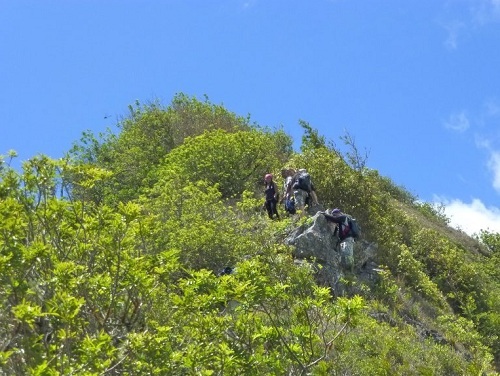 When we reached the base of the spur that leads to the summit of Kawiwi, we began the heart-pounding ascent up a grassy slope punctuated with silk oak trees. 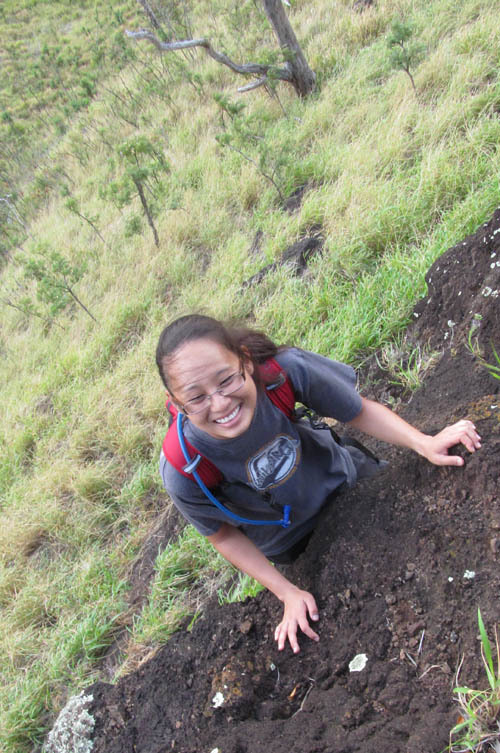 While making our way up the slope, I learned from Chelsea that she was in a master’s degree botany program at the University of Hawai‘i and was working on a research plan for her dissertation. With our common interest in native plants, we stopped briefly to examine a fern that thrives in drier climates on the island — ‘iwa‘iwa (Doryopteris angelica) whose fronds have an unusual branching pattern. The slope increased in steepness and soon we were scrambling up rocky inclines with lots of conveniently placed footholds and handholds. We were pleased when the clouds over Mount Ka‘ala began to dissipate and wind began to subside. It was nice to feel the warmth of the sun as we scrambled up the rocky ridge line. 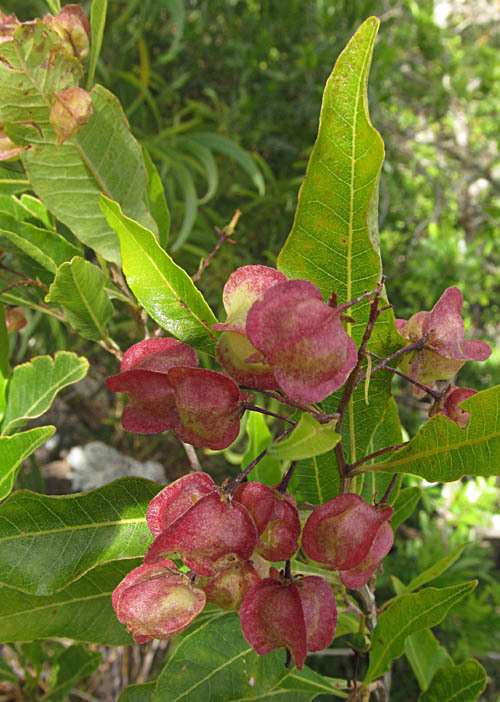 Much of the ridge is dominated by formosan koa and christmas berry — invasive trees that have taken over many of the drier areas of the island. 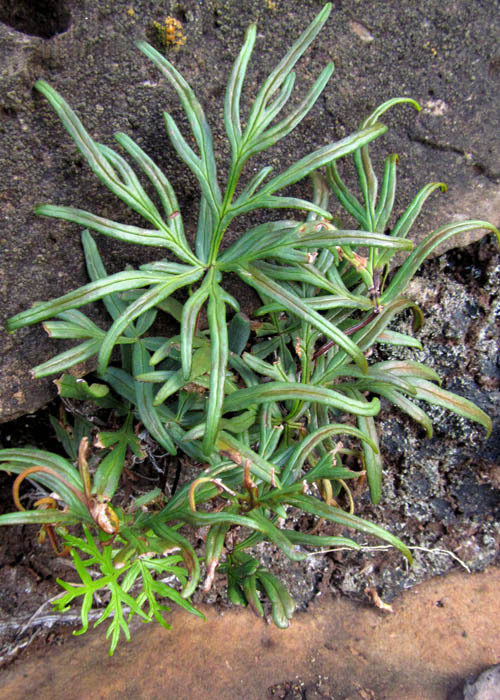 But we saw the occasional native plant like this ‘a‘alii — Dodneaa viscosa — which had brightly colored seed capsules. 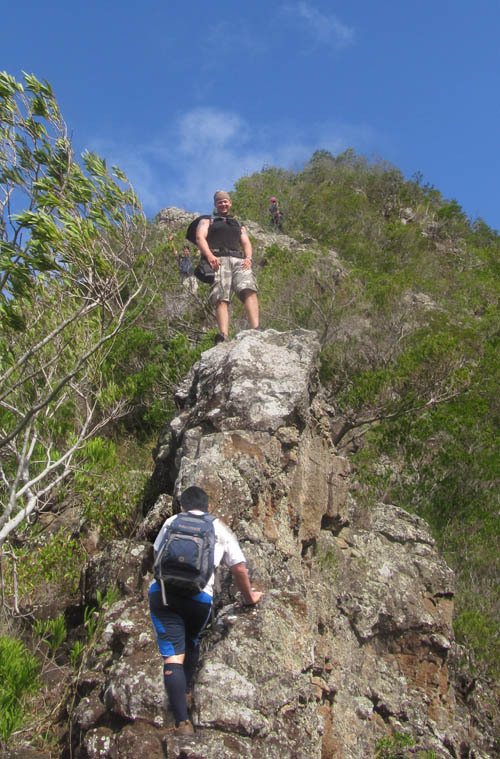 The rock faces increased in steepness as we gained elevation and made our way towards the top. With so many photogenic hikers on the climb it was impossible to take a bad shot. 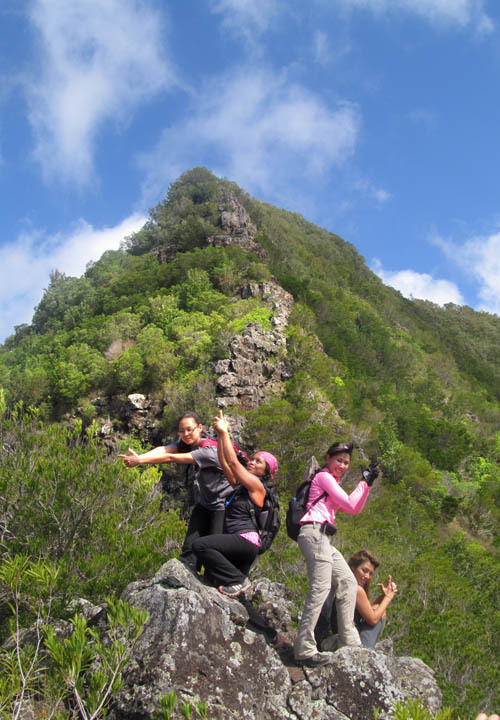 The girls posed for a “Charley’s Angel’s” shot just before we reached a narrow section and the most challenging part of the climb. With gusts of wind throwing us off balance, some of us opted to get a lower center of gravity as we made our way over a narrow spot with drop-offs on either side. Given how defensible this section is I speculate that many a battle might have taken place at this very spot. 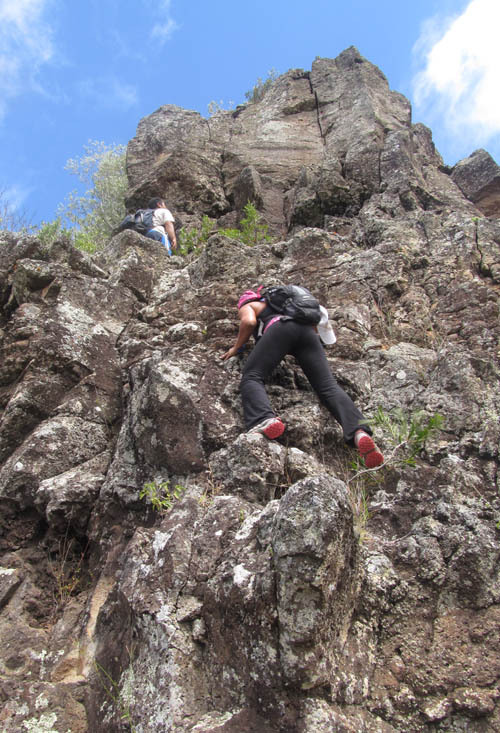 Soon we reached the most challenging part of the climb which required us to climb up a rock face. Fortunately there were lots of footholds and handholds which made the cliff climbable. 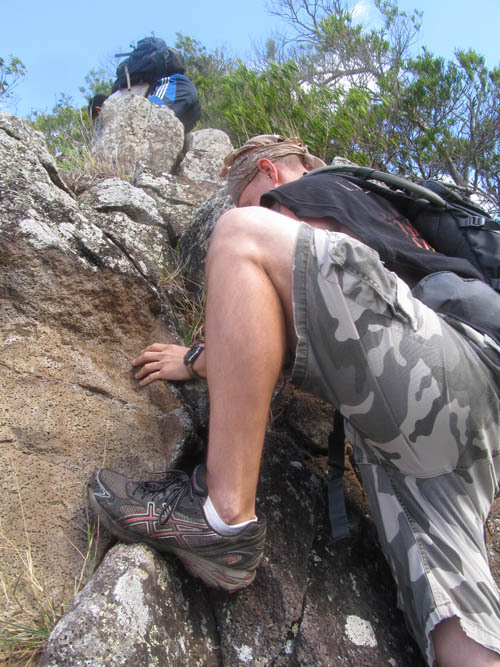 But some of the rocks were loose — a major hazard — so we tested each rock before we used it and called out to warn those below us whenever we dislodged a rock — which happened several times. 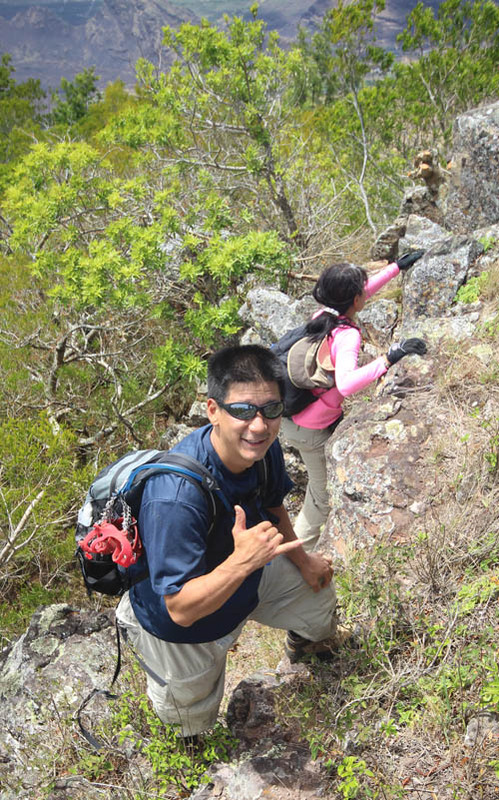 Our hike leader for the day — Baron Yamamoto — was all smiles when we reached the summit of Kawiwi without mishap or injury. 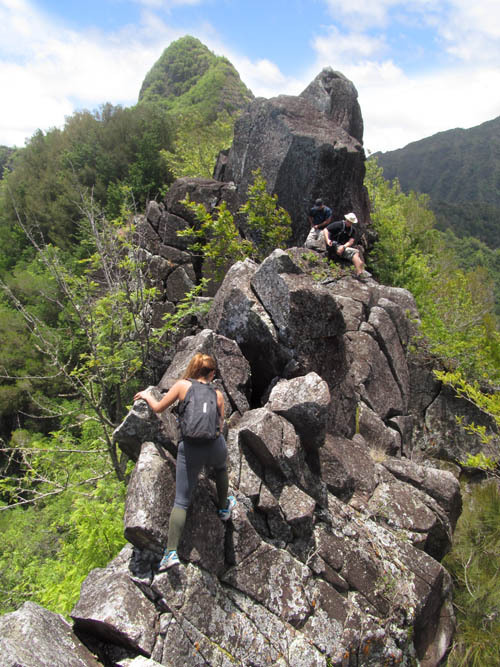 With only three approaches to defend, we could see how the summit of Kawiwi could be used as a natural fortress — although the area at the top is small and could not possibly accommodate a large force. The defenders must have been distributed along the spur and spine of the ridge. 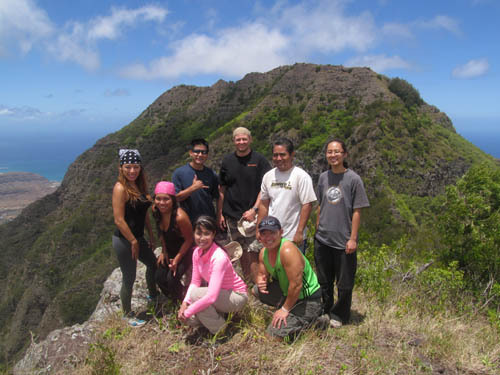 The summit offered panoramic views of Wai‘anae and Makaha. When we looked at the low ridge that separates Wai‘anae from Lualualei and traced it inland to Kauao Pu‘u, we could see the blackened earth where a brush fire swept through several weeks ago. 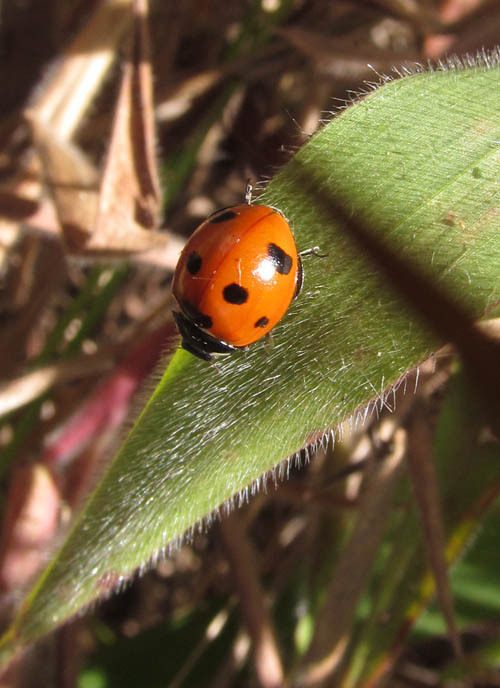 There were a number of lady bugs at the summit and I could not resist getting a close-up shot as we ate our lunches and enjoyed each others company. After eating our lunches we pushed-off along the narrow spine of Kamaileunu Ridge to make our way to NoName Peak off in the distance. 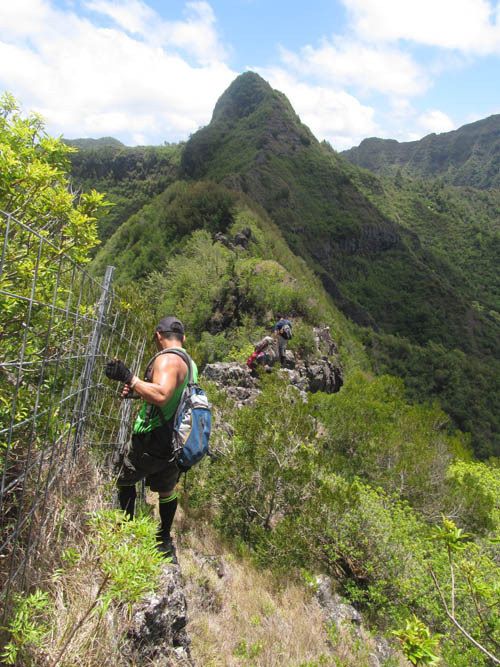 Fences have been constructed along the Kamaileunu ridge line to protect rare native plants from pigs and goats. The funnest part of the days adventure was the section dubbed “broken teeth” by Wing Ng where large boulders are balanced along the spine and stick up menacingly. With steep drop-offs on either side adrenaline coursed through our veins as we crossed the “broken teeth”. Given how narrow and strategic the rocky boulders are to protecting the northern approach to Kawiwi, I speculate that many a battle might have taken place at this spot as well. We continued past the last boulder and reached an ironwood grove before reaching the base of NoName. After gaining a few hundred feet of elevation we finally made our way to the summit of NoName where we rested for a bit and enjoyed the view before pushing-off again. We descended NoName along the spine and crossed over the fence at a couple of spots before making our way to Tiki Ridge where an outcrop of boulders are balanced. 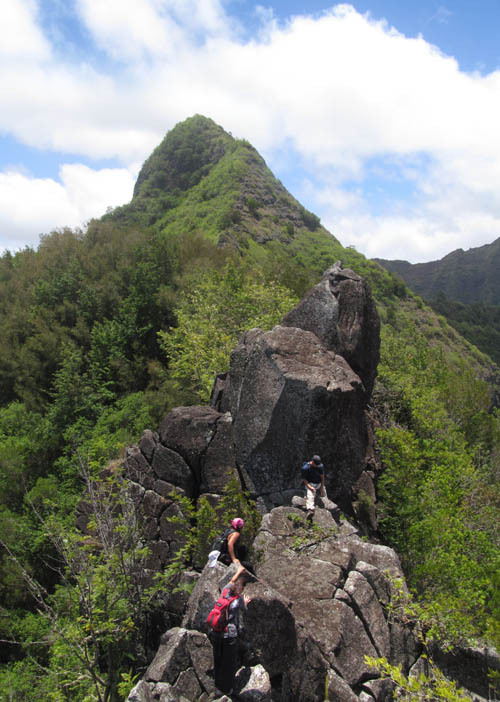 The boulders at Tiki Ridge are huge and tower over the ridge line like sentinels watching over Wai‘anae and Makaha. 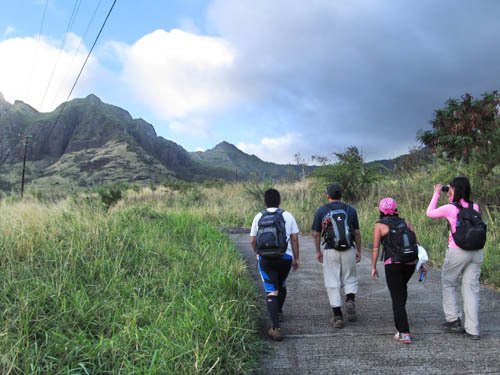 When we reached the Wai‘anae Kai Trail, we turned off Kamaileunu Ridge and descended the State Trail. 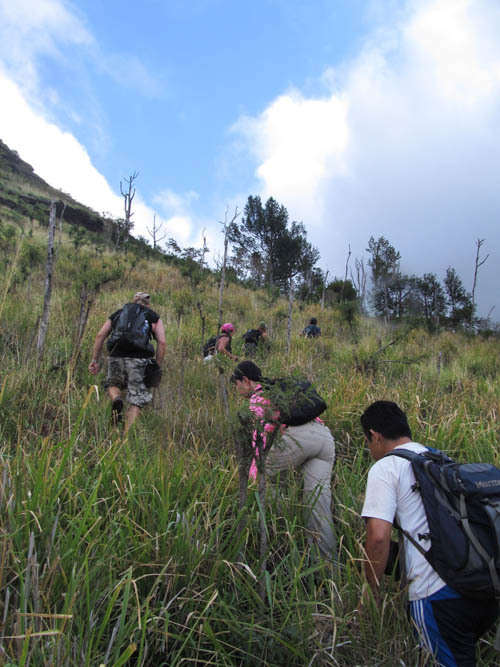 The rest of the hike was uneventful compared to what we experienced earlier in the day. After descending the Wai‘anae Kai trail we came to groves of strawberry guava many of which were loaded red fruits which we picked and ate to our hearts content. While looping back to where we started, I could not help but reflect on the great time we had climbing up multiple rock faces to the summit of Kawiwi, traversing the broken teeth along the spine of Kaimaileunu Ridge, and imagining in my mind’s eye what might have taken place at Kawiwi when the King of Maui invaded O‘ahu. What a great hike! 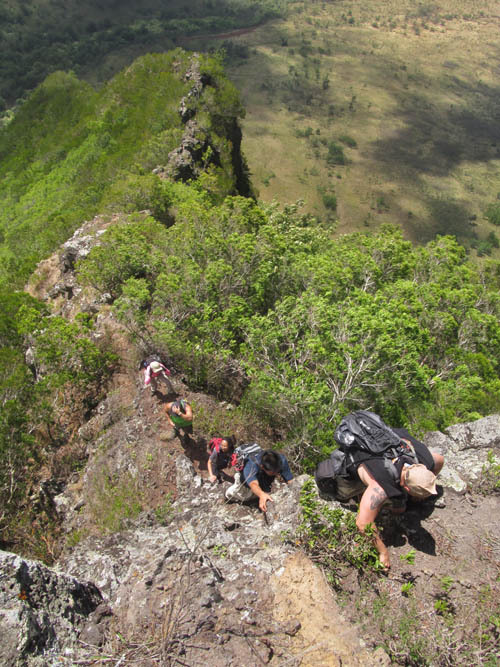 WARNING: The Kawiwi-Wai‘anae Kai Loop is not for the acrophobic or faint of heart. 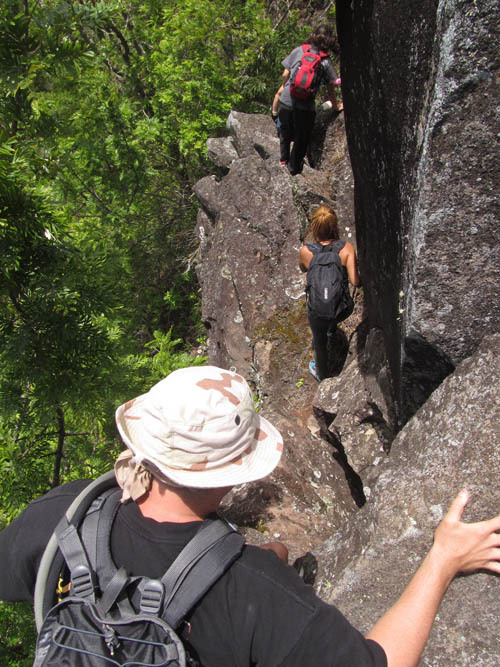 The route traverses narrow crumbly rock that readily breaks apart and is easily dislodged. 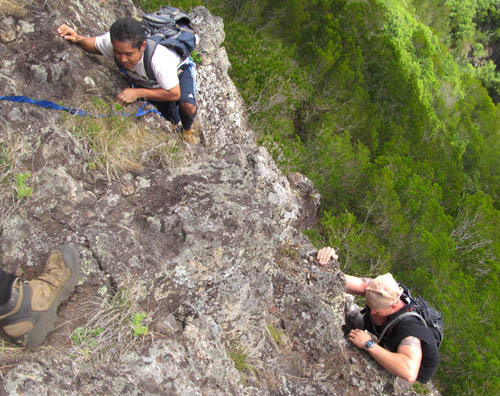 With steep drop-offs along the way, the margin for error is small and and any slip at an inopportune time is likely to result in serious injury if not death. 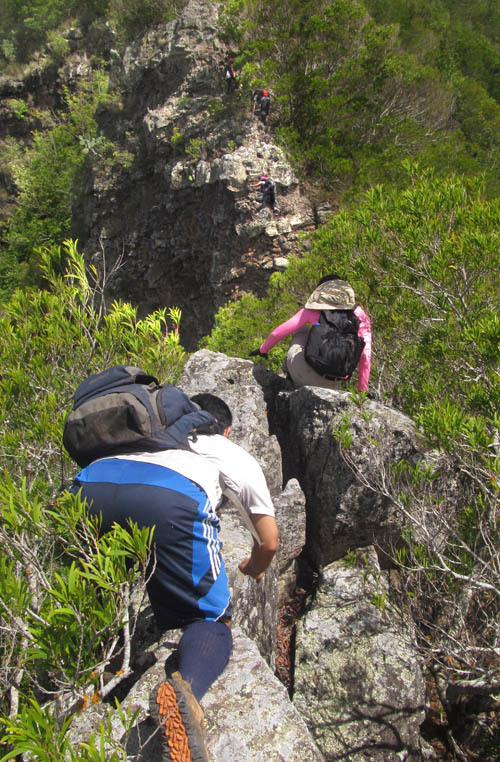 Falling rocks create hazards for hikers following in the wake of others and this hike should only be undertaken by experienced climbers accustomed to dealing with crumbly rocks. Great write up Nate, nice meeting you on the hike! 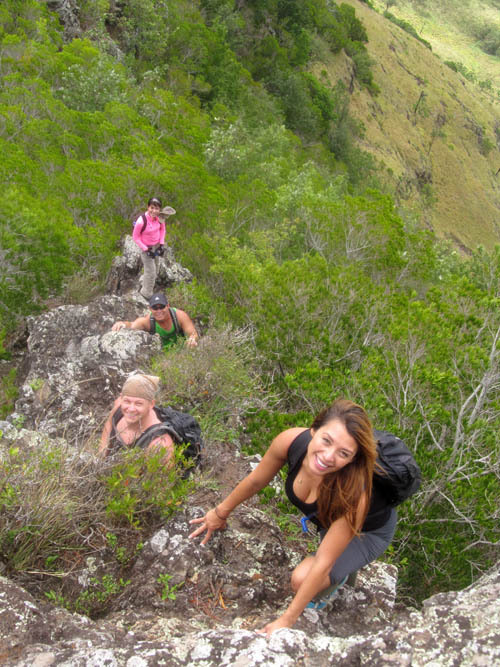 Not being scared of heights is a must on this hike. Was very nice meeting you too Troy. Its always cool to meet someone in person for the first time you only knew previously online. Yep… its not for anyone whose acrophobic. Thanks for capturing the moment as only you know how, Nate!!!! Yes… then you should most definitely take your time and go slowly. Fortunately, there are lots of interesting things to see along the way. Cool… Kaua is AWESOME! Big climb to the top! Thank you Nate for capturing this awesome day out on the trail. I had a great time not only hiking but meeting you and the others. Hope to see again on the trail someday soon.